Welcome once again to another fun Compendium of Curiosities III Challenge! A Compendium of Curiosities Vol. III. Now, back to the challenge! I have to admit, this was a new one for me. I didn't have any embossing diffusers and honestly didn't know this product even existed. (Shame on me, right?) Luckily I already had a Sizzix crease pad which worked beautifully in the sandwich as Tim describes it in the book. He actually used the silicone rubber pad, but I found I got a better impression with the crease pad. You'll have to test it out and see what works best for you. With me and my hubby's 23rd anniversary just around the corner (May 9th), I thought I'd make his card early so I wouldn't forget. My style may be vintage feminine, but I do love switching into masculine mode when creating projects for a change. Don't you? Let me share how it came together. 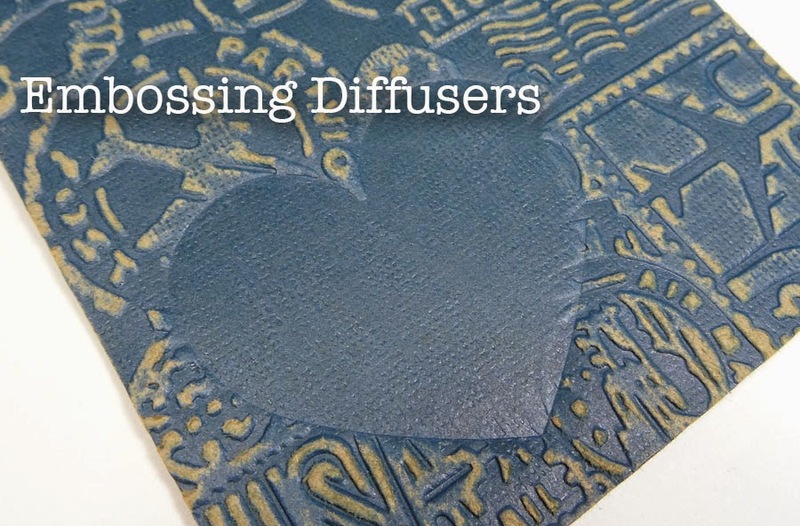 This shows the Embossing Diffuser in action, without giving away too much from the book. 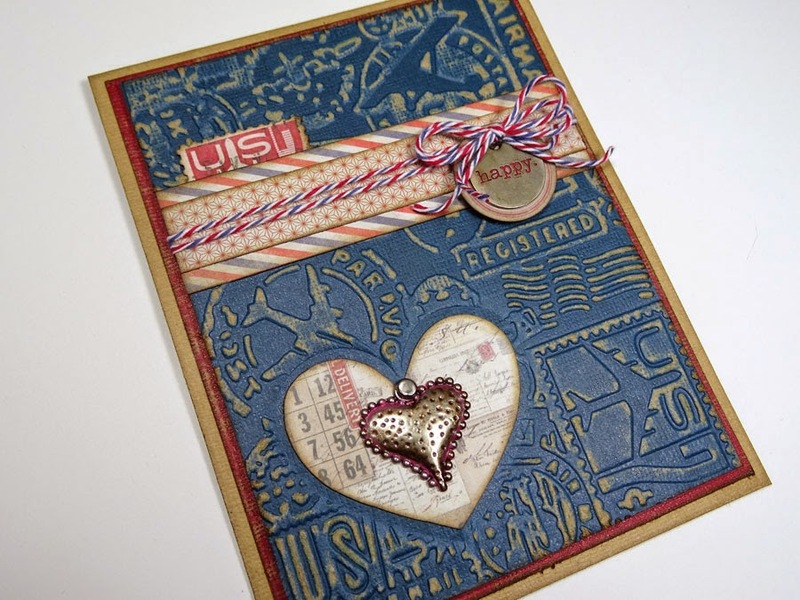 I used the smallest heart in the set as well as the Airmail & Compass texture fades. I used dark blue Kraft Core card stock and sanded the raised areas. Onto some Correspondence Paper Stash, I traced the small heart onto an area of the 3 x 4 sheet and cut it out a little smaller than the traced line. I grabbed some other supplies, and cut more papers. I also gathered a few ephemera pieces from the Expedition pack. I wanted to pull some red into all the small metal pieces, so I dabbed on some Fired Brick Distress Paint, then followed up with a touch of Mushroom Alcohol Ink. 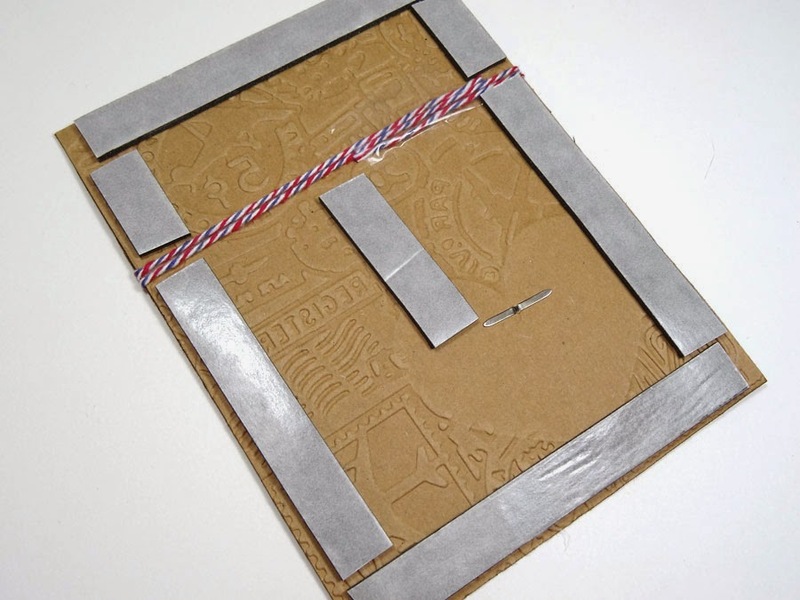 Onto the blue card stock, I started to layer some of my elements, wrapping some May Arts red-white-and blue baker's twine around the unit a few times. 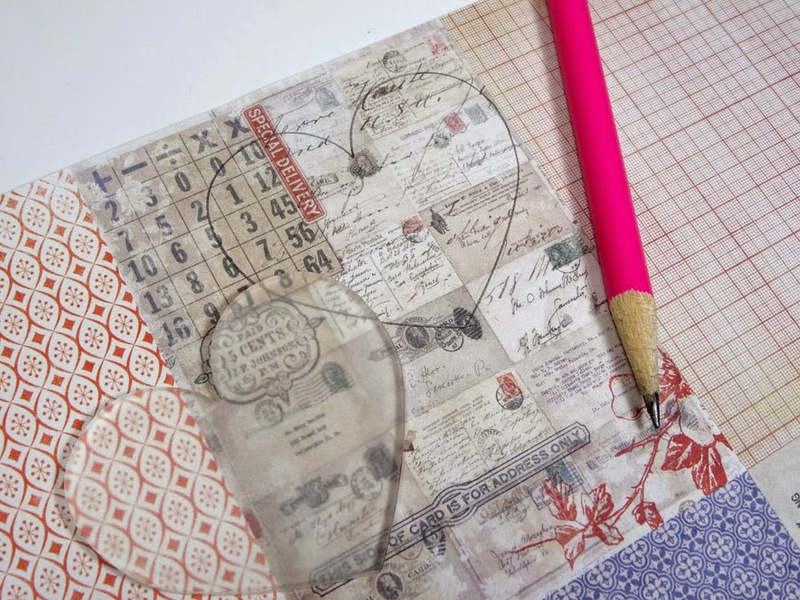 Notice the ephemera piece tucked behind the striped paper at the top? It's a postage stamp from the ephemera pack that reads U.S. Air Mail, but I tucked it behind the strip so it looked more like "US." I attached the heart with a brad through this layer too. Then I flipped it over and put plenty of black foam tape to pop up this unit on my card base. My card base is kraft and the next layer is a deep red. I added a Typed Token and more baker's twine to the top of my card. Annette...this card is flawless! 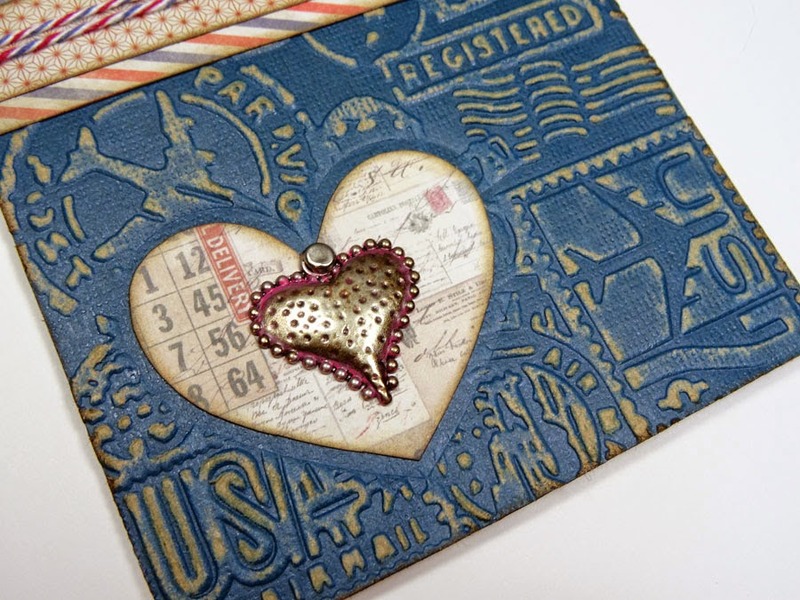 I love the heart embossing folder! Didn't even know that bad boy existed! 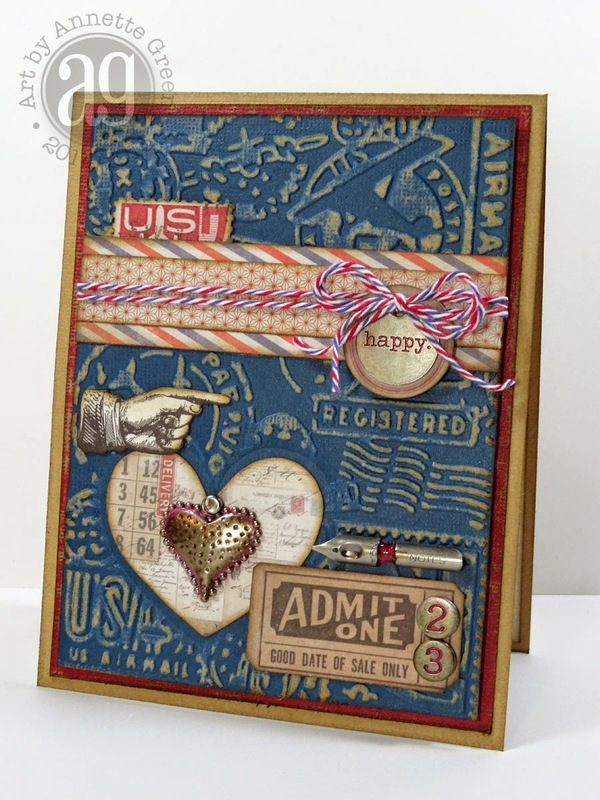 Your card done in the correspondence/air mail collection is amazing! All of your layers of mats, embossing, twine, tape and other elements are perfection! And the inside of your card is beautiful, too! Happy Anniversary a bit early! Now this is a fabulous card! You always do the most fabulously finished off, attention to detail work! Love the coors and all the layers. AND the way you filled in the heart! Clever girly! wink. big hugs. Great card and Happy Anniversary! 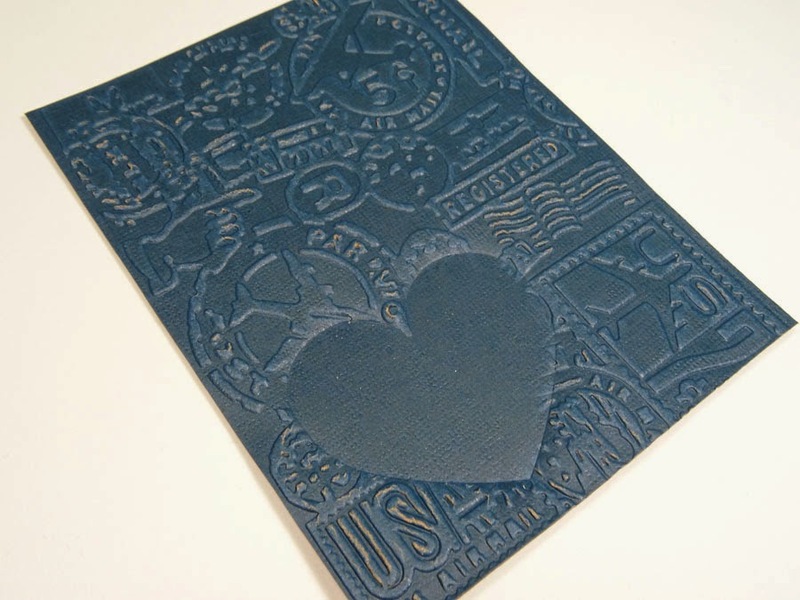 I simply love the way you put the heart inside the debossed heart. What a great anniversary card, I know Paul will love it. I can always use inspiration for more masculine themes as birds and flowers seem to come easily for me. 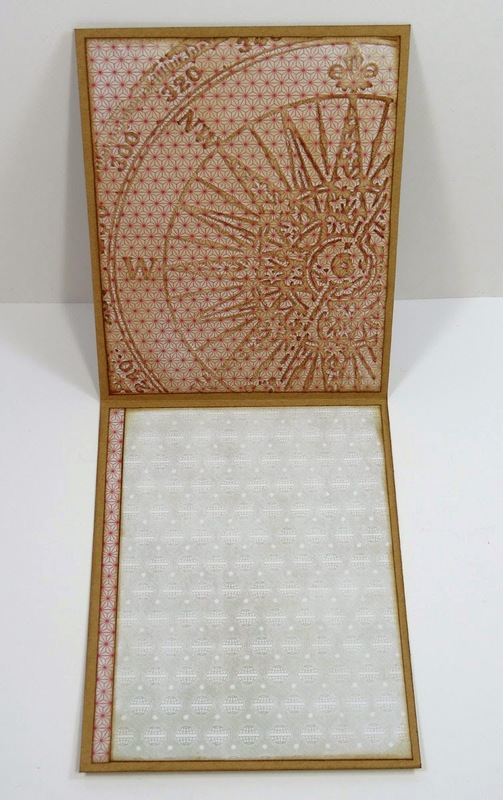 The Kraft Core paper is an absolute LOVE and perfect for Embossing Diffusers. Happy Anniversary! Happy Anniversary - very soon! It feels so great to be a head of the date - perfect decision for your project. Your hubby will adore this card. It is totally FANTASTIC. 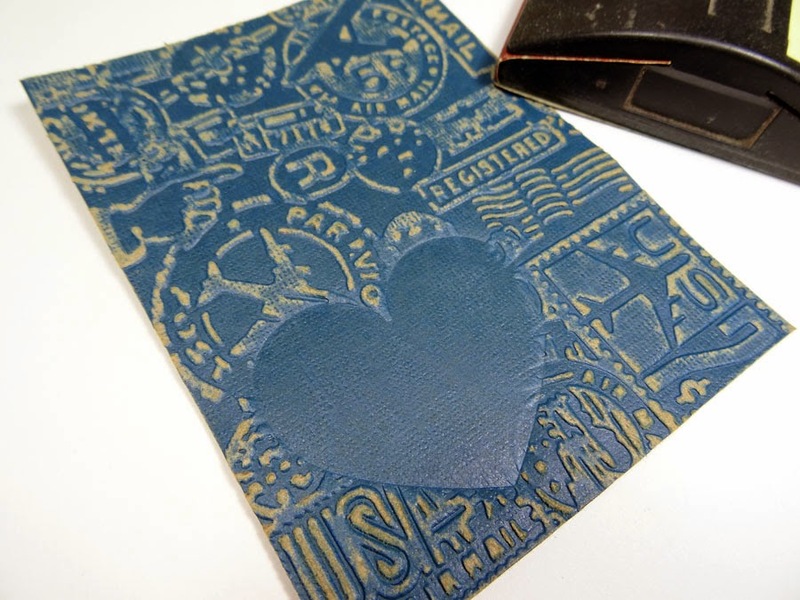 The embossed background it just out of this world and the way you did the heart - just awesome. Wow... INCREDIBLE. j.
Annette this is an awesome card, every little detail. You have nailed this one! Fabulous card! Love how you pull all the details together into a wonderful whole. 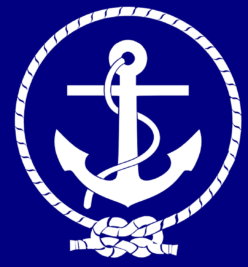 Happy 23rd Anniversary! Wonderful card. Love all the elements and texture. Beautifully masculine inside and out. Annette your card turned out beautiful. Very special to the occasion and congratulations on 23 years of marriage. I wish you and Paul many many more! Wait...What??? He has a small off-center set??? And I missed it??? Zoinks! I love your card; it is a perfect Anniversary Card..Congratulations! This is gorgeous and perfect, from the color choices to the embellishments. The charm is absolute perfection in that space! 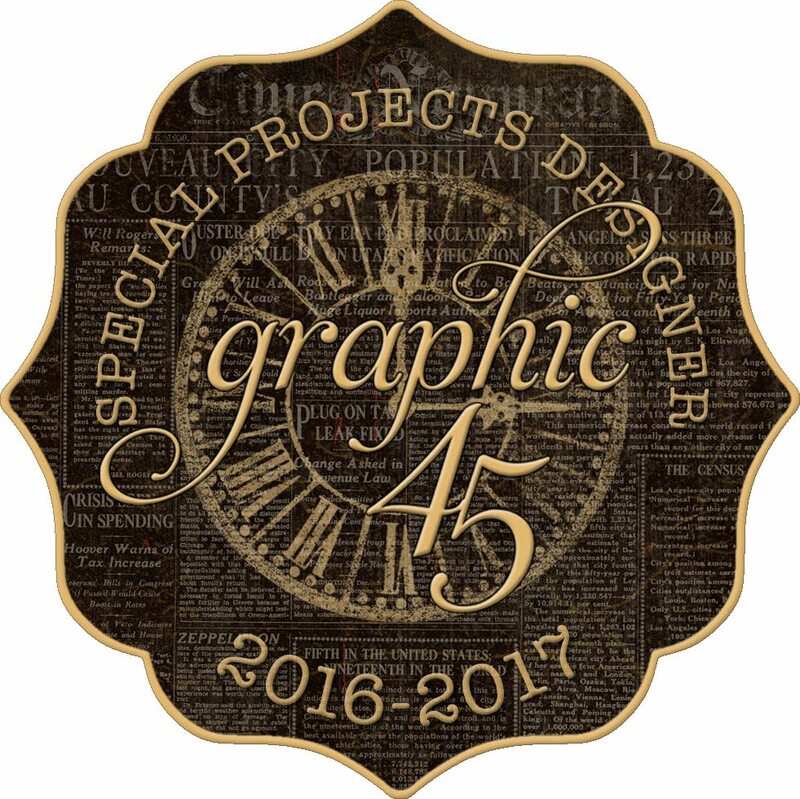 Like you, I didn't know about embossing diffusers and had to order one just for this challenge. I've been doing a lot of experimenting and having such a great time! Thanks so much for the inspiration. This card is so beautiful, Annette! You really do have amazing attention to detail! 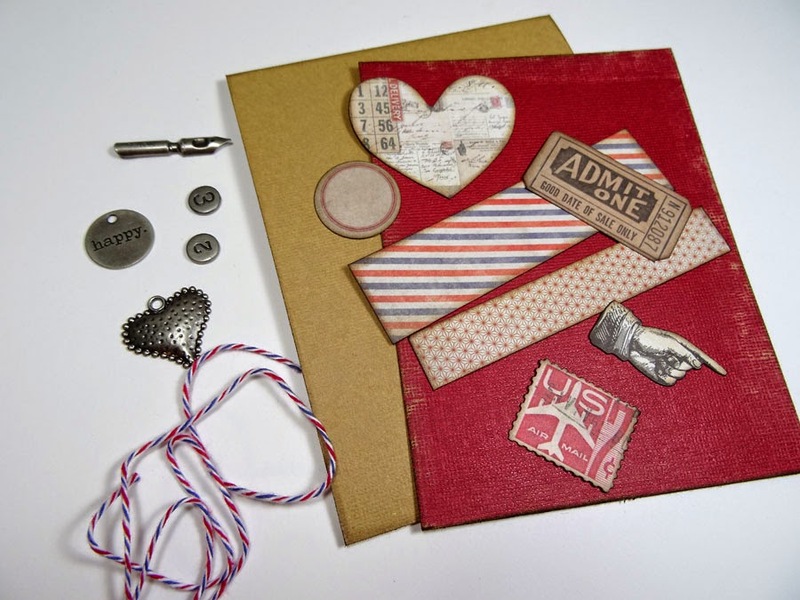 Love the correspondence theme and your use of the heart diffuser - I like that one a lot! OH MY!!! This is the kind of card I wish I could make. Love it. I love this card!!!! Happy Anniversary! I'm sure your husband will love this card so much, I find it very original and not at all banal. I haven't seen the heart embossing diffuser til now but I love it. Fantastic card Annette! LOVE all the new goodies on this Annette...you nailed it! LOVE the heart diffuser too...I need to use it! Gorgeous! As others have said, i didn't know that heart set even existed! And I'm with you on the crease pad... I had good results with it too! I'm another person who didn't know the heart diffuser existed! I love your postal card, and everything is so perfectly done! Using the "US" at the top is just creative genius! Love this, Annette! Congratulations on your wedding anniversary this card will be very well received I'm sure. I just love the soft blue colour with that splash of red - fabulous. I really like the placement you used and all the different elements that coordinated perfectly. It ties this together in such a way that it looks like a kit! superb card Annette, i love the technique. you did a great job with the embellishments. Annette, What a GREAT anniversary card...I am sure your husband will love it. 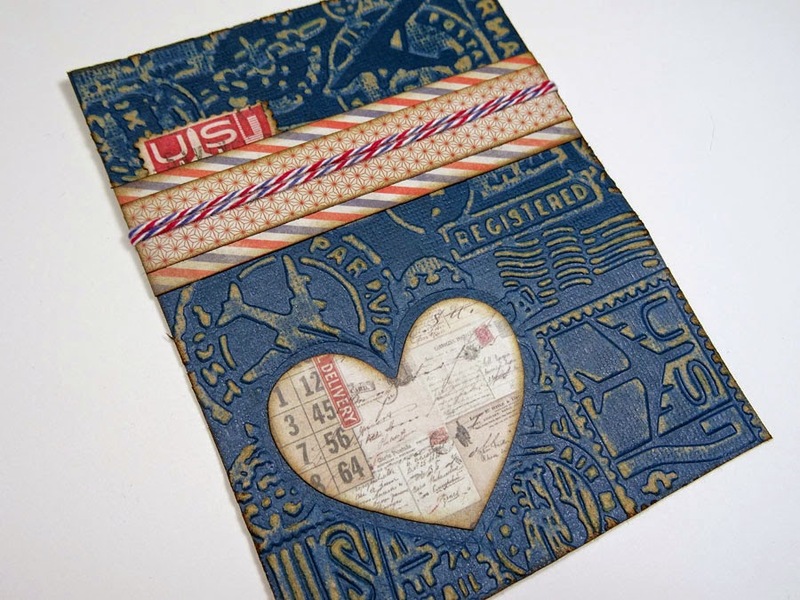 I like how you used the Kraft Core paper with the embossing folder and the Correspondence paper within the heart. 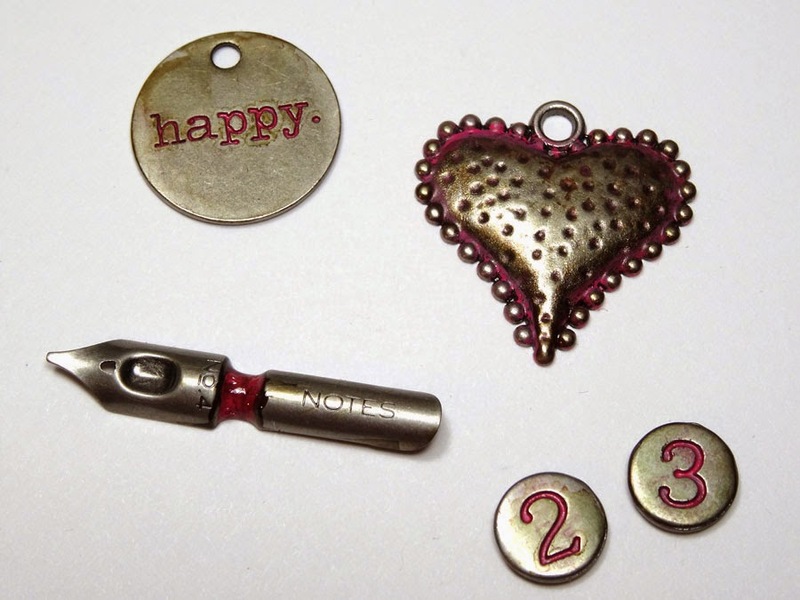 Such a clever use of embellishments too! annette, this is such a great card!!! How did I miss it? Love all the details!